Hey friends! 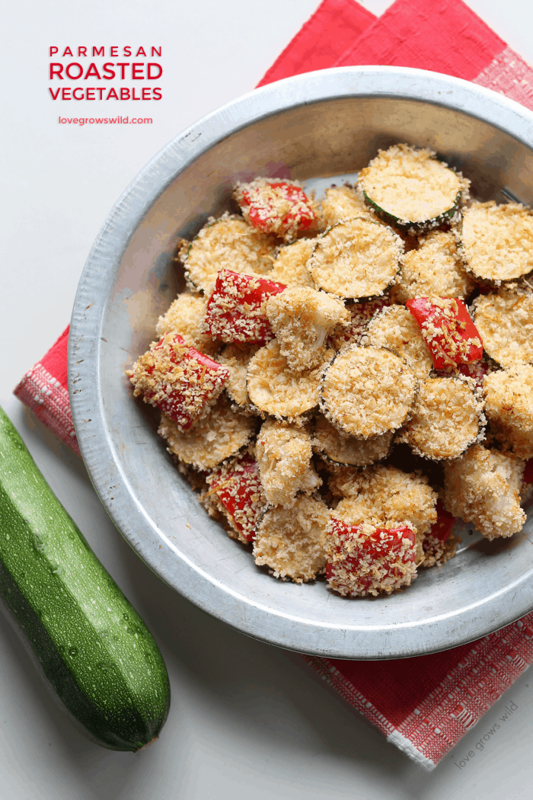 It’s Liz from Love Grows Wild, and I have been bursting at the seams waiting to share this delicious side dish with you! This time of year, our gardens and grocery stores are overflowing with fresh produce, and I’m all about taking advantage of this glorious season. Fresh sweet corn? Amazing. Just-picked strawberries? Glorious. Juicy, perfectly-ripe peaches? Don’t even get me started. It’s always easy for me to find ways to incorporate fresh fruit into my diet, but vegetables can be a bit more of a challenge. Zucchini and cauliflower aren’t all that exciting, right? My mom made these Parmesan Roasted Vegetables for us a few weeks ago, and I’ve made them at least 4 or 5 times since. Ah-mazing! You’re going to love this simple, easy, and super flavorful side dish! These yummy vegetables are roasted in the oven with a coating of Italian dressing (tons of flavor!) and a panko/Parmesan mixture that is out-of-this-world. The coating gets super crispy, almost like the vegetables were fried, and the zesty Italian dressing soaks into the vegetables making them extra flavorful. This recipe is easy to make, cooks up quickly, and can be used with almost ANY vegetable you have on hand! This time I made them with zucchini, cauliflower, and red peppers, but I’ve made versions with green beans and squash that are amazing too. 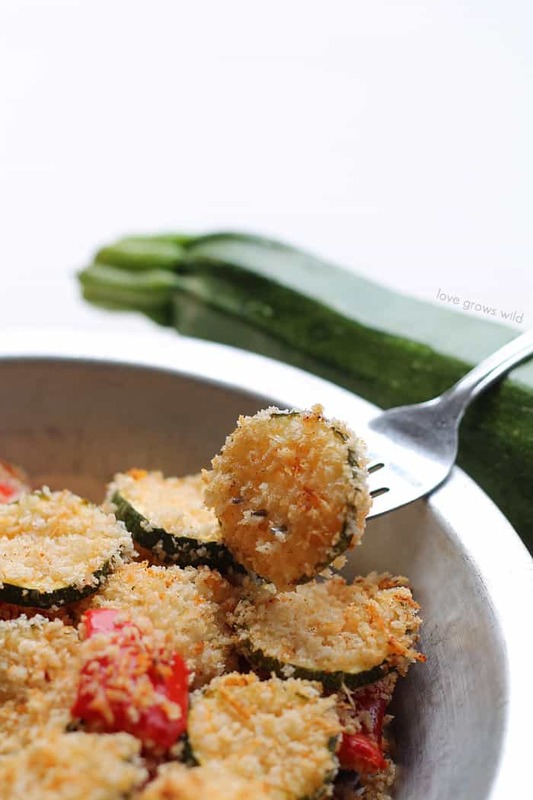 Pick your favorite veg, add a cheesy breadcrumb coating, then roast till perfection! This has become a staple recipe in my kitchen this summer, and I hope you enjoy it too! Preheat oven to 425ºF and line 2 baking sheets with parchment paper. Place chopped vegetables in a zip-top bag and pour in Italian dressing. Shake the bag until vegetables are fully coated. 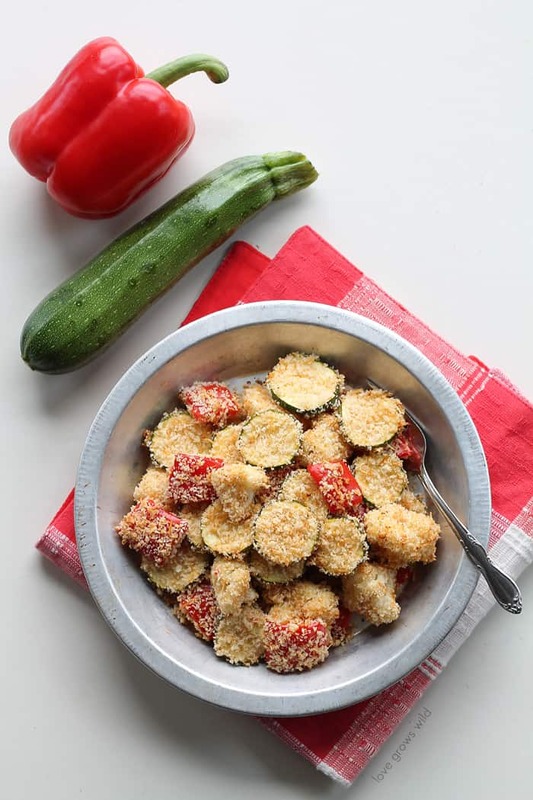 In a shallow baking dish, mix together panko breadcrumbs, Parmesan cheese, paprika, and garlic powder. 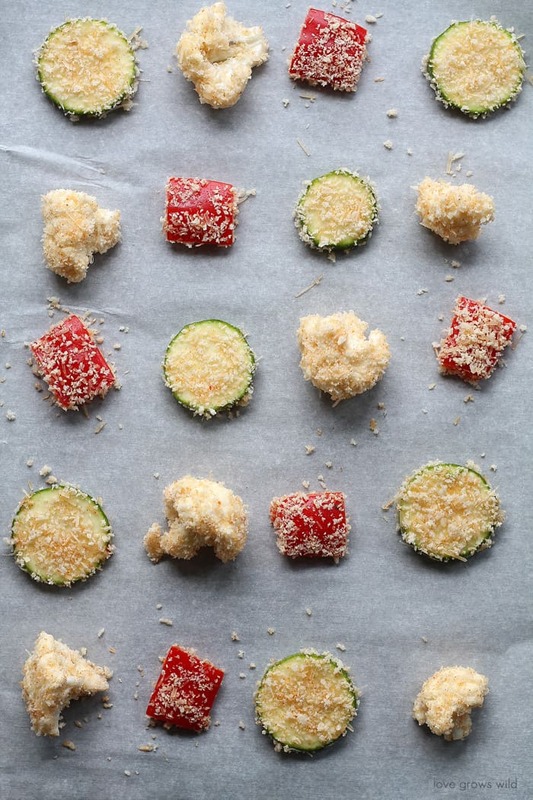 Add a handful of vegetables into the breadcrumb mixture and coat on both sides. Place vegetables on the lined baking sheets and repeat until all the vegetables are coated. Bake for 15-18 minutes until vegetables are tender and breadcrumb coating is golden brown and crispy. Serve immediately. 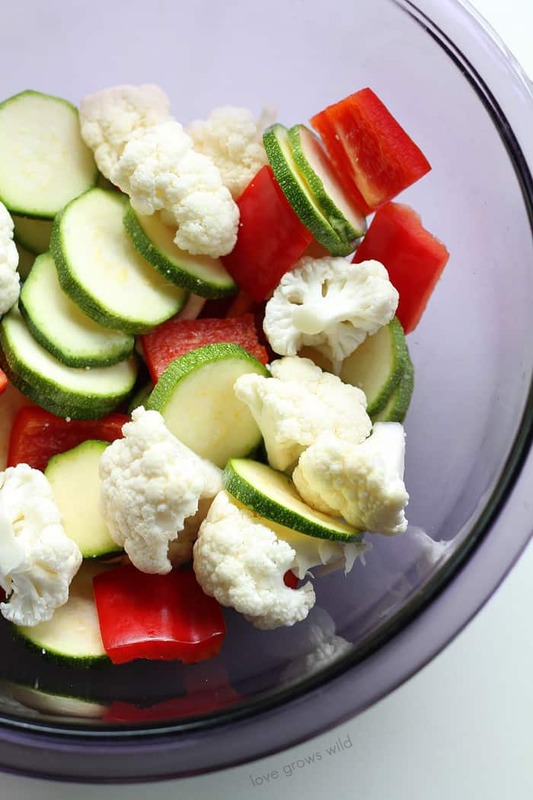 - Just about any fresh vegetable will work well in this recipe: cauliflower, sweet peppers, zucchini, green beans, etc. Try a variety! 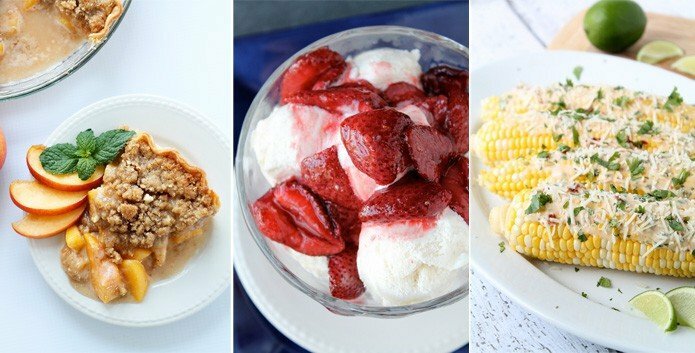 Stop by Love Grows Wild anytime and try some of these summertime recipes! Liz your photos are always gorgeous and these are no exception! Great recipe & pinned! They look so good with all that parmesan all over them! I’m always glad to see a good veggie recipe. Thanks for sharing this one! One of the best ways to get the most flavor out of your fresh summer vegetables is to roast or grill them! This Parmesan Roasted Vegetables brings out the natural sweetness, and when topped with salty parmesan they taste unbelievable! Photos looks so awesome and delicious. Sheesh, the recipe rater thing messed up! That’s supposed to be 5 stars ! Hope it can be corrected. Tnx for the recipes…..more power!!! These recipes appear doable for beginners like me. Love parmesan. Love roasted veggies. Thanks for a great recipe! I am looking for the Parmesan garlic roasted potatoes. They were wonderful but I have lost the recipe! A little more Parm and some fresh black pepper and I’m roasting some veggies soon! This looks so beautiful and flavorful!